A Bicycle By Any Other Name? Since I recently had ACL surgery, and I like bikes, my uncle thought I could use this to rehab my knee. (I think he was kidding). The idea is you walk, then run, and gain speed. When you have enough speed, you put your feet on treads located on the back wheel and glide. When you need to pick up speed, you start running again. So you are essentially traveling faster than if you were just walking or running because you have two wheels to assist you. (Just like how Fred Flintstone got his car going). It is certainly interesting. But ... is this a bike? Would it be subject to the same laws other cyclists have to obey? Or are you a pedestrian, and thus subject to a whole different set of rules? Well, first place to start is the legal definition of a "bicycle". A "bicycle" means every vehicle propelled by feet acting upon pedals and having wheels any 2 of which are not less than 14 inches in diameter. Ok. Big thing here, as highlighted, is that the feet have to acting upon pedals to be a bicycle. Obviously, with the Fliz we are missing feet acting upon pedals since feet propel the Fliz by touching the ground, not pedals. 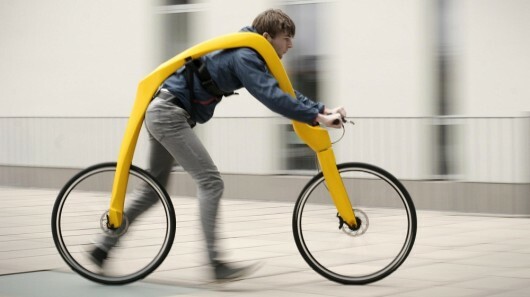 So this thing is not a bike, at least according to Wisconsin law. So, is the operator a pedestrian? A "pedestrian" means any person afoot or any person in a wheelchair, either manually or mechanically propelled, or other low-powered, mechanically propelled vehicle designed specifically for use by a physically disabled person, but does not include any person using an electric personal assistive mobility device. I think pedestrian is probably closer to what the operator of a Fliz bike is, at least given the two legal definitions in Wisconsin Statutes. An operator of this gadget is afoot, except when gliding. When gliding, the feet are on treads on the back wheel. The key distinction is the simple fact that when using the Fliz bike, you are not propelled by pushing pedals, you are propelled by your own feet upon the ground. Why does this matter? Because pedestrians have different rights and obligations than a cyclist. Pedestrians, when walking in the street, must walk against traffic. Cyclist must ride with traffic. Pedestrians must cross in a crosswalk. A pedestrian does not have to signal when turning. There are many examples and I just wanted to throw out a few. I am sure my reader(s) are intelligent enough to see the differences and think of others. So, if you purchase the Fliz, you may be tempted to act as if you are out on a bike. But you need to remember that you are actually a pedestrian, and need to act as such. Kind of like if you were using a Razor scooter, or going for a walk. This article is a must read for everyone, but especially for those of you who think medical malpractice claims are frivolous. Every job has a purpose. Part of mine is to help those injured and/or killed through preventable medical errors.